Columbus, Ohio, is one of those big-little Midwestern cities. You can’t go very far without running into an old rival. Just ask Satch Sullinger. As head coach at East High School, he’d designed his defense to shut down Eastmoor Academy star shooting guard Benji Burke. The lithe Burke would dive and dart across the court, stealing the ball on one end and scoring it on the other. The Sullingers and the Burkes had a little history. Years before, Sullinger had matched up on the playground and in summer games against Benji’s father, Alfonso Burke. “Columbus was a small town then,” Sullinger recalled. “We called him Pookie — and Pookie was a hell of a player.” Alfonso Burke starred for East High School in the 1950s. When Sullinger stalked the school’s sideline nearly three decades later, he sought a little payback against Alfonso’s son. The 1983 season opener marked Sullinger’s first as a head coach. He tried masking his nervousness. That he had become a coach would have been a surprise to even him years earlier. After Sullinger graduated high school, he drifted from job to job, never satisfied with the money in his pocket — until he started toting a gun and selling drugs. He ran the streets of Columbus while maintaining a day job counseling troubled kids — children whom he warned to stay off the same cocaine and heroin he sold. One day, police busted down his door and hauled Sullinger off. Pat Penn, then the coach at Oberlin College, knew Sullinger from his playing days at South High and spoke on his behalf in court. A judge sentenced him to an education-based probation. Sullinger could avoid prison if he managed to turn his life around. His brush with the law straightened Sullinger out. He became a 26-year-old freshman at Oberlin in 1975, which paved his return to the game and a conference championship the following season. Basketball runs in the Sullinger family. Satch’s father, Harold, was known as “Suitcase Sully” because of his enormous hands. He played for the Sioux City Colored Ghosts, a black barnstorming team in the 1920s and ’30s that was a precursor to the Harlem Globetrotters. Satch’s brother, Harold Jr., earned the nickname “Briefcase” and played at Iowa. Satch — whose real name is James — was a 6-foot-8 bruiser at Oberlin who bullied inside, just like Alfonso Burke. Benji Burke did not play like his father. “He was a scorer,” Satch Sullinger said of the sweet-shooting Benji Burke. “And he had a real quick release. We had to find a way to slow him down.” Sullinger noticed that Benji’s sweet spots came at the wings. He installed a one-three-one zone that flooded the area with defenders. Sullinger may have been a novice coach, but his defenders snapped to on his command. “Baby boy!” he would yell before barking an instruction. “Baby boy!” When they finally faced off, the game between Eastmoor and East High teetered back and forth. Sullinger prevailed in his debut, a streak of winning openers that would span more than three decades. Twenty years after the inaugural victory, he’d win a particularly satisfying opener when he coached his own son, Jared, and Benji’s, Trey. 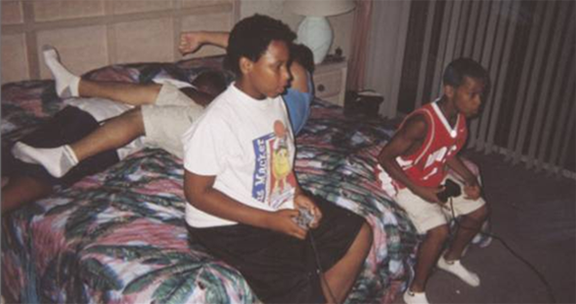 Today, Jared Sullinger and Trey Burke are at the earliest moments of promising NBA careers. The dual dream started in the Burkes’ basement when they vigorously competed against one another in any and every game they could imagine. “So much that it sounded like they were tearing up the house,” said Ronda Burke, Benji’s wife and Trey’s mother. Their present is a manifestation of generations of basketball, each pushing a little bit further than the previous one. Finally the Burkes’ and Sullingers’ double fantasies have become a reality. They didn’t think much of each other at first. Benji Burke went to Northwest Missouri State, where he set the school’s (since broken) steals record during the 1989-90 season. When he returned to Columbus to start his family, he taught his son to play the game the same way he did. Trey took to the game quickly. His thefts became so prevalent that one league created a rule that he had to stay behind the line until the opposition passed midcourt. When he began to form a team, Benji Burke could hardly find a third-grader who could keep up with his son. By then, “Sullinger” and “basketball” had become synonymous in Columbus. Satch’s oldest son, J.J., had played shooting guard at Ohio State. Satch coached his middle son, Julian, at Columbus’s Northland High School. Julian later played at Kent State. Benji Burke knew of J.J. He had seen Julian play. But he didn’t know Satch’s youngest boy, Jared. The first thing Benji noticed was Jared’s belly — he’d labored after a couple of runs back and forth. But he marveled at young Sullinger’s nimbleness. Satch had Jared performing footwork drills by the age of 2 and shooting regulation free throws by 3. For a big kid, he moved like a dancer. 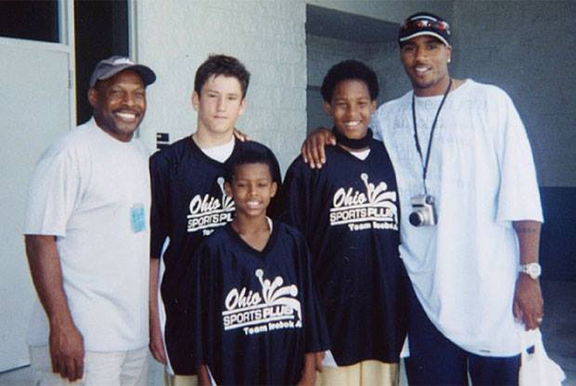 Jared was less than a year older than Trey, so Benji Burke asked the fourth-grader to join the AAU squad, Team Reebok, that he was putting together. Julian Sullinger showed up to practice one day to check on his little brother’s progress. He left amazed by both Jared and Trey. The competiveness that could get out of hand in the Burkes’ basement bonded them on the court. Their AAU team also featured Traevon Jackson, the son of former NBAer Jim Jackson and Wisconsin’s starting point guard, and Adam Griffin, the son of two-time Heisman Trophy winner Archie Griffin. Shortly after Jared and Trey were reunited, the time came for Satch Sullinger to inherit the coaching duties. By Jared Sullinger’s sophomore season under his father, he’d trimmed much of his baby fat, his sizable posterior transformed into a verifiable weapon for clearing out space in the post. The Burkes decided to enroll Trey at Northland as well, choosing it over Eastmoor, where Benji served as an assistant coach. Those Vikings carried a pristine record of 21-0 into the postseason. But Jared’s schoolwork had slipped and he landed on academic probation. He was averaging 19 points a game, but after he failed to file a biology class assignment, Satch Sullinger benched his star player — not to mention the focal point of his team’s strategy and his son — during a district semifinal game against Westerville South. Before the game, Satch Sullinger stopped Jared when he tried to put his jersey on. He told his son that if everyone fouled out, he would rather play with four players than let him into the game. Northland lost, 67-59. The perfect record, their season, all of it, was lost and over. Jared watched the game in silence, hoping that the worst wouldn’t happen. When it did, when the team returned to the locker room with no tomorrow, he punched lockers. He cried. The Sullingers returned home. Satch Sullinger turned off his coach’s brain and again became a parent. What happens if my son has a learning disability? Am I putting too much pressure on him? he wondered. He asked the school psychologist to sit down with Jared. The doctor found no learning disability. Instead, Satch was told that his son was purely interested in making it to the NBA. Everything else was unimportant to him. Satch wouldn’t accept that. Jared Sullinger walked to the free throw line nearly a year later. He had straightened himself out in the classroom and Northland had enjoyed another banner season. Sullinger earned the state’s Mr. Basketball title. With more playing time, Burke blossomed, too, reemerging as Sullinger’s running mate. More than 12,000 people packed the Value City Arena bleachers for the Division I state championship game between Northland and Princeton. Burke had hit a free throw to give Northland a 58-56 edge with 27.6 seconds left, but he fouled a player behind the 3-point line 13 seconds later. Orlando Williams sank two of his three free throws, evening the game. A Princeton player stunningly fouled Sullinger behind the 3-point line on Northland’s possession with 2.7 seconds remaining. Burke thanked Sullinger between shots. “I would’ve been devastated if we would have lost,” Burke said. Sullinger made the second. His third careened out. A heave by a Princeton player fell short as time expired. To Satch Sullinger, the result reflected a transformation in his son’s life. Jared Sullinger and Trey Burke settled into their final season playing together. Northland replicated its success during Jared’s senior season. The Vikings won national games against high school powerhouses Findlay College Prep of Nevada and Virginia’s Oak Hill Academy. The Sullingers swept the James A. Naismith Awards as the top prep coach and player. No. 1–ranked Northland shockingly fell to Gahanna Lincoln in a district final. Sullinger amassed 24 of Northland’s 45 points. Sullinger would become a Buckeye after his senior season. He, Aaron Craft, Jordan Sibert, and J.D. Weatherspoon had played together for the same AAU program and they all committed to Ohio State together. Burke originally hoped to follow a year later. He and Sullinger fantasized about how they could be like Mike Conley and Greg Oden, lifelong friends, one small and one big, who played at Ohio State before entering the NBA. But Ohio State had already offered a scholarship to Shannon Scott, a highly rated guard from Georgia. “People wanted to see that special combination again and that’s why it was kind of a shock that Ohio State was the only one in the world that didn’t see that specialness in those two together,” Benji Burke said. Trey Burke committed to Penn State. Jared Sullinger had one of the better freshman seasons in recent memory at Ohio State, propelling the Buckeyes to 24 straight wins to start the 2010-11 season. “Seeing him do what he did his freshman year in college, that motivated me even more going into college,” Trey Burke said. Burke decided he had committed too early and reopened his recruitment. He signed with Michigan, figuring that he would spend a season apprenticing under Darius Morris before taking over the program. Northland, however, fell in the state championship game against Cincinnati’s LaSalle. Burke managed just 10 points and misfired on all seven of his 3-pointers. He vowed to never fail in a big game ever again. The time that Barbara Sullinger and Ronda Burke had dreaded finally arrived. John Beilein, Michigan’s coach, had been cautious about Burke during his recruitment. He had taken a look at him only at the urging of his staff. “And thank goodness we made a decision late after seeing him in July again,” Beilein said. Each wanted to claim the first win. Of course, neither played very well. 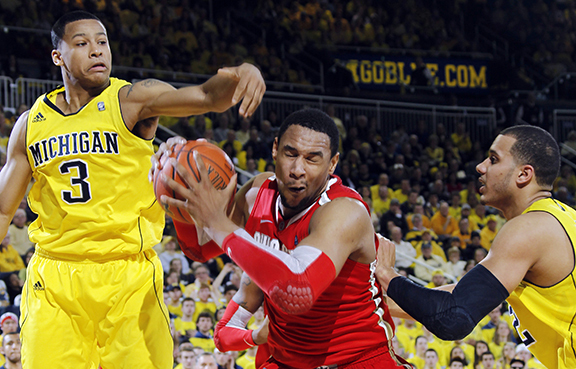 Foul trouble limited Sullinger, while Burke tallied 13 points in Michigan’s 64-49 loss. Michigan claimed revenge the next month, sending Ohio State to a 56-51 loss in Ann Arbor. With time running out, Burke stopped short and released a midrange shot when he saw Sullinger in the lane, knowing that his old pal would position himself to take a charge. Burke’s rainbow floater helped clinch the game. Ohio State again fell just short of Sullinger’s goal, losing in the Final Four to Kansas. Ohio University had already shocked Michigan, ousting the Wolverines from the tournament in the second round. They had not come into college together, but they planned to leave at the same time. Sullinger declared for the NBA. Burke wanted to make the jump. Things didn’t work out the way either had hoped. NBA teams medically flagged Sullinger because of back problems. He had once been projected as a consensus top-five selection. Instead, he plummeted in the draft, spiraling down to Boston with the 21st pick. 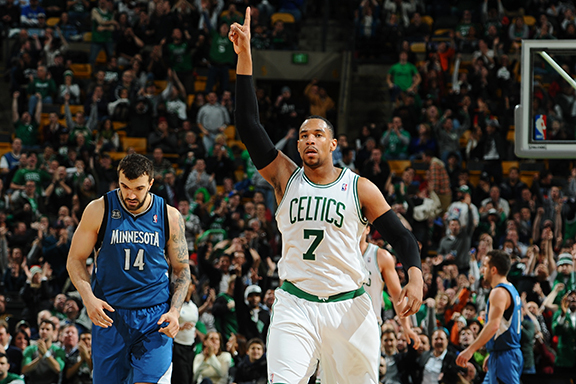 Jared Sullinger became a favorite pupil of Kevin Garnett during his rookie season in Boston. Burke returned for what would be a transformative sophomore season at Michigan. The Wolverines had once been an elite program in college basketball. The Fab Five recruiting class of 1991 represented a cultural phenomenon. But in the years since, the Wolverines had been hit hard by sanctions and upheaval. Burke helped reenergize Ann Arbor. The team sprinted to its best start in school history during Burke’s sophomore season. He earned national player of the year honors and guided Michigan to the title game. Sullinger, for one night at least, became a Wolverines fan. The Wolverines lost to Louisville. Burke played only six minutes in the first half with foul trouble, but he returned with a fury and finished with 24 points. The game changed in a crucial moment when it appeared Burke cleanly blocked Peyton Siva’s attempt at the basket with 5:09 remaining. Burke was called for a foul and Siva hit both free throws to initiate a 7-2 run from which Michigan never recovered. “That was clean as a whistle,” Benji Burke said. Minnesota took Burke with the ninth overall pick and dealt him to Utah. He was the first point guard taken in last year’s draft. One day while they were still in middle school, Jared and Trey waited at the Sullingers’ before a Northland game. Jared had been ironing his clothes, but was interrupted by an impromptu game of catch. Sullinger exceeded expectations during his rookie season before undergoing season-ending lumbar disk surgery on his back in February. He returned this season to a rebuilding Celtics team without Garnett and Paul Pierce, and for the first time in his life had to come to grips with frequent losses. He takes offense when he hears that the organization is tanking. In one memorable moment this season, he scored 17 fourth-quarter points while trying to wrest a win away from Memphis. The effort, like many of Boston’s games this season, fell short. However, last week Sullinger earned Eastern Conference Player of the Week honors after averaging 20.3 points and 12.7 rebounds. Burke missed the start of the season while recovering from a bone fracture in his right index finger. The team started 1-13 before he took over as starting point guard, and the Jazz then went 15-18 during his first 33 games. 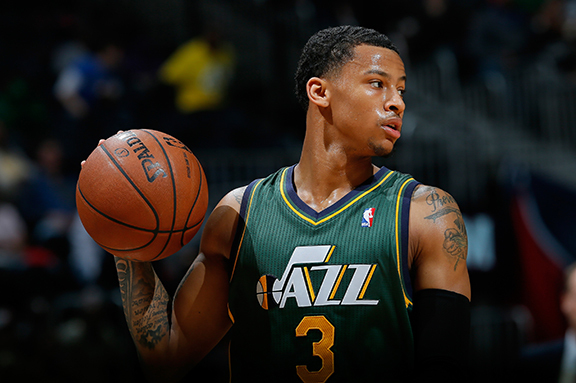 He is now one of the few bright spots in an underperforming rookie class, not to mention a key figure in Utah’s future. Satch Sullinger retired from coaching in 2011. He has since written the book on coaching, literally. “You really don’t appreciate it,” said Julian Sullinger, now an assistant coach at Tiffin University, said of his father’s counsel. “Even at my age, I don’t know if I fully appreciate it yet. But he does so much for us off the court. He taught us more off the court [than] while on the court.” Benji Burke, meanwhile, is Trey’s agent. The odds of a male high school basketball player making it to the professional ranks are about 3 in 10,000. For two nearly lifelong friends to both make it? The odds are practically impossible. Still, they overcame obstacles. One was too big, the other too small. One had a bad back. The other a crooked shot. Yet here they are, the fat kid and the pip-squeak playing basketball with a bucket in a basement. They’ll face one another for the first time in the NBA later this month when Utah hosts Boston.1 But they will again be teammates this weekend in the league’s Rising Stars Challenge, the all-star game showcasing the league’s best freshmen and sophomores. Burke missed the teams’ first matchup because of his injured hand.